Not sure how Singer can make profit selling 9100 at this price. It is so tempting to be honest. The machine is feature rich as well. You might not see this model readily available in all the stores. 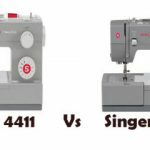 Singer 9100 is a sewing machine that is slowly making its baby steps in the sewing world (as it was just released in 2013). It is a feature rich sewing machine, it has to be said. It comes with 404 built-in stitches including 13 Basic, 4 Stretch, 184 Decorative, 194 Alphabet stitches and 9 Fully Automatic One-step Buttonholes. You can do monogramming on this machine. You can use upper case and lower case for monogramming. 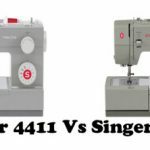 Singer 9100 is a beautiful sewing machine. 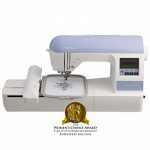 It has a large LCD screen (when compared to machines from other brands), where you can view all the stitch functions, tension settings and the recommended presser foot (the machine will suggest the presser foot need to be used for a particular stitch pattern). 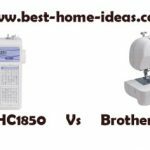 Even better thing about the machine is the built-in memory to save up to 20 customized stitches or patterns and the ability to use them later. You can even edit the saved patterns and the machine will remember the changes for future use. 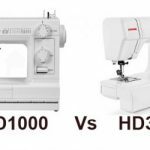 Mirror imaging and elongation function is another option that you normally don’t get on sewing machines under this price category (I have felt the price as very tempting, normally you don’t get these kind of machines at this price. So I rechecked whether it is refurbished or something like that. It is not refurbished. It is a lottery, especially when you consider the features on-board). Impressive thing is that, you can mirror image or elongate a stitch with just the push of a button. It is as easy as you can get. The stitches can be elongated for up to 5 times the original length, keeping the stitch density in tact. 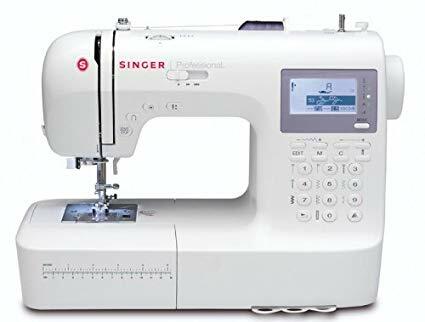 Singer 9100 has a start/stop button and speed control slider, which lets you sew without using the foot pedal. The speed control slider provides very good control. The needle can be programmed to stay in the up/down position according to your needs. A thread cutter (manual) is also provided on the machine. 9100 comes with horizontal thread spool for even feeding and reducing thread breakage. The automatic needle threader threads the needle for you (a real boon for those with sight issues). The machine comes with a top drop-in bobbin. The clear cover for the bobbin lets you monitor the bobbin thread supply. The Automatic Bobbin Winding Declutching on Singer 9100 disengages the needle bar while winding the bobbin, preventing unnecessary up and down movement of the needle thereby making it more safer. Even though the machine sets the stitch length and width automatically, you can override them for customization (this is a default option on almost all machines today, not a big surprise). The extra-high presser foot lifter allows better clearance while working with multiple layers of fabrics. You can reinforce stitches by using the automatic locking stitch function. The electronic twin needle control on 9100 automatically adjusts the stitches for twin needle sewing, that too with just the touch of a button. This machine comes with 13 needle positions. If anything goes wrong with the machine, it will start beeping. You can disable the error alarm if you wish. Tension and presser foot pressure on this machine is automatically set for optimal results (there are no override options). The 7 segment box feed system of 9100 ensures consistent quality. The presser feet is snap-on, which means you don’t need a screwdriver to change it.Singer 9100 has a drop feed lever for free motion sewing. An on-board storage compartment is provided for storing the accessories. The extension table allows enough space for large projects. Included accessories are : All Purpose Foot, Zipper Foot, Buttonhole Foot, Blind Hem Foot, Satin Stitch Foot, Overcasting Foot, Darning & Embroidery Foot, Gathering Foot, Rolled Hem Foot, Button Sewing Foot, Edge / Quilting Guide, Pack of Needles, Bobbins, Thread Spool Caps (2), Auxiliary Spool Pin, Spool Pin Felt, Screwdrivers (2), Brush/Seam Ripper, Foot Control, Soft-Sided Dust Cover and Extension Table. As I said earlier, this machine has all the features of an advanced sewing machine. I have tested it with light, medium weight and stretch fabrics and it all went well. Singer 9100 is easy to set up. This machine has so many features that it will take at least a month to use all of them. The main selling point of this machine is that you can do two sets of monogramming. There aren’t many new machines available. Even though this machine is pretty good on heavy fabrics, it won’t be a good idea to sew 6 plus layers. The answer is a straight ‘yes’, especially with the current pricing. You won’t get a better sewing machine (with this many features) for the price in U.S. I am not sure how long this discounted price will last, it is a great deal as long as it is there.